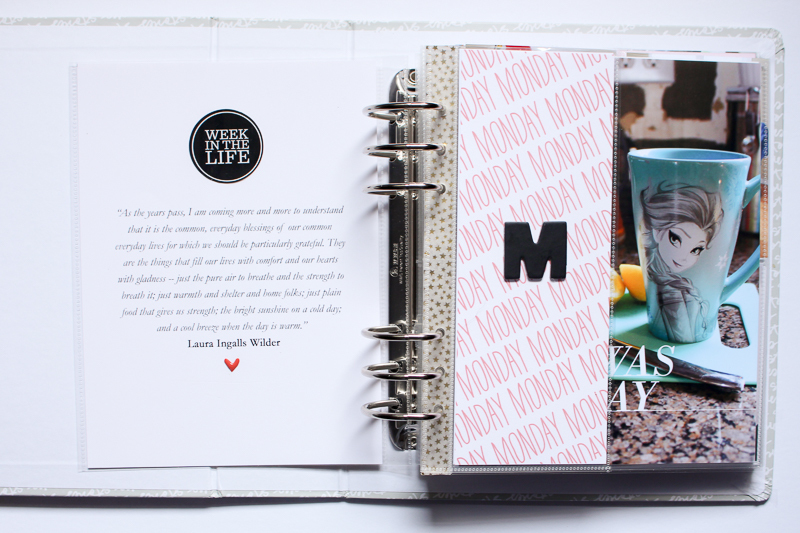 Well, I've finally gotten some time to sit down and start putting my Week in the Life album together. Yay! I do like having a bit of a break after the documentation, and since we were away on vacation literally the day after my week ended, that worked out well. I also really loved following along with everyone else documenting their weeks - it's always fun to see how different, or the same, other people's (total random strangers!) lives are. However, I was almost excited to come home from vacation, just so I could get working on my album! I tried planning it out a bit while we were away, but was just finding it too hard without any of my supplies with me... I needed to actually see everything. I'm hoping to get this album done in the next 2 weeks or so, and have kind of put all of my other projects on hold to complete it. Last WITL it took me about 7 months to complete my album. Not horrible - I'm just glad I completed it, period! But I would like to just get this one done while things are as fresh in my mind as possible. 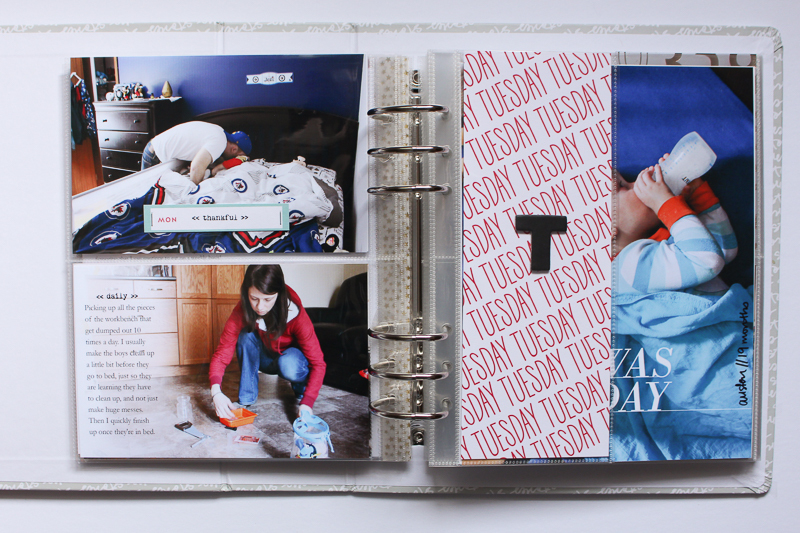 My approach it to go day by day to complete the album - aside for the title pages for each day. I already have those all picked out and printed, and in the album. But other than that, I am mostly doing things in daily 'chunks'. I do like having consistency throughout my album, so now that Monday is done, there are a lot of elements, or designs that I will be repeating daily, to take some of the guess work out of it all. I don't have my opening page for the album set yet - I had meant to take a family photo for that purpose, and totally forgot during the week. So I'm still undecided on what I'm going to do there. 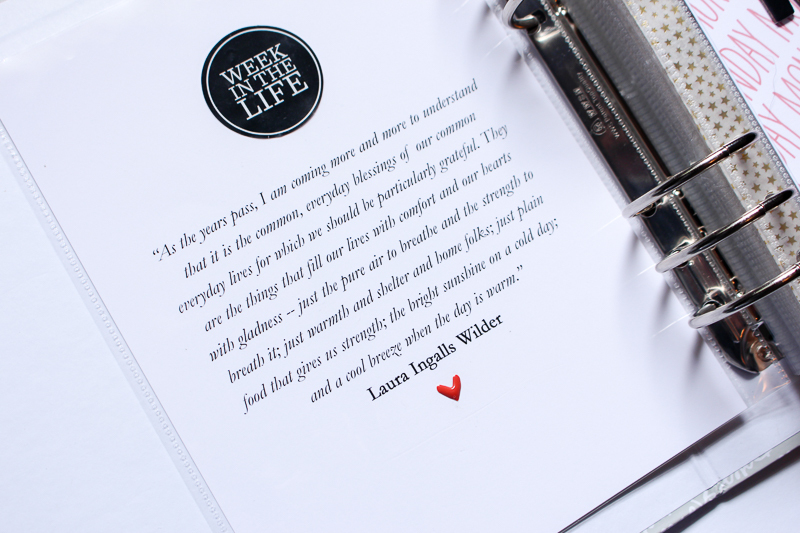 But on the back of the opening page, I decided to use this quote, by Laura Ingalls Wilder. I love it because it highlights the importance of 'everyday life', plus, I was a huge Little House on the Prairie fan when I was growing up, and read that whole series multiple times. So I loved how that tied in as well. 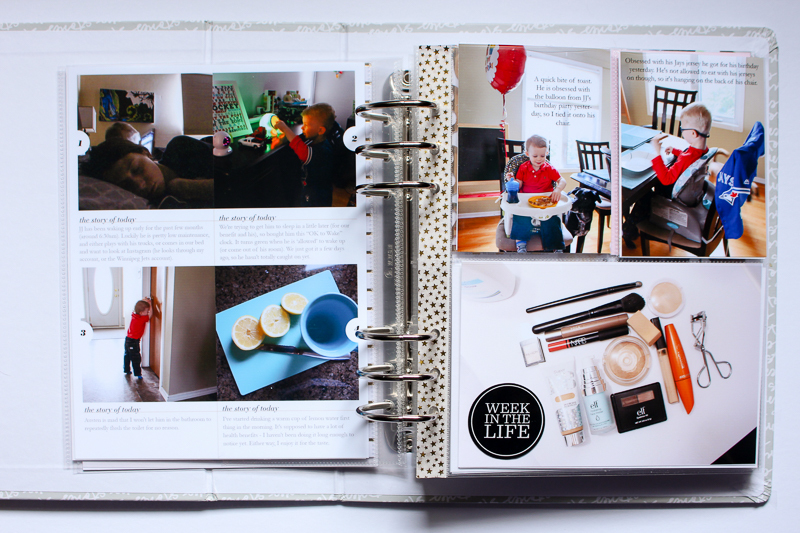 And I love those "Week in the Life" packaging stickers - I saved all of them from the kit to use throughout my album. 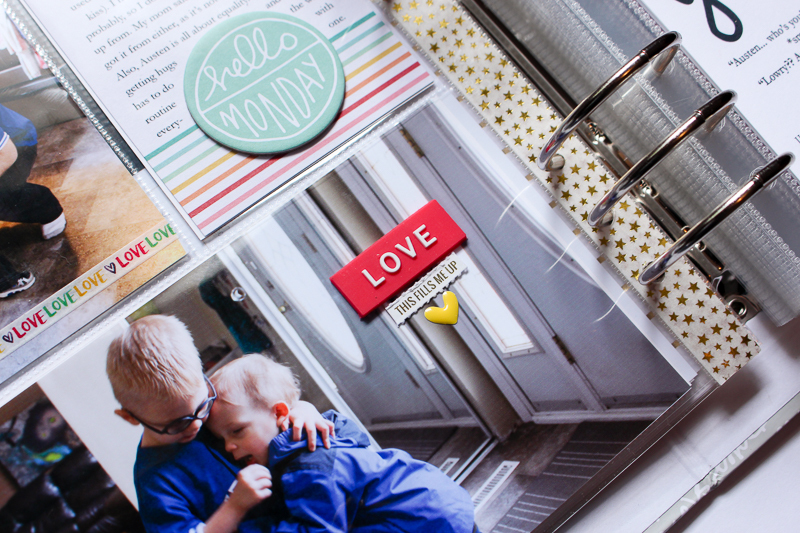 For the little 3x8" intro page, I created the weekday background with this digital stamp set, and just included the black chipboard "M" from the Week in the Life kit. On the back of the 3x8" intro page, I added some gold-foiled lined paper. For days going forward my plan is to either just add patterned paper again, or possibly a photo, or other quotes I have about everyday life. 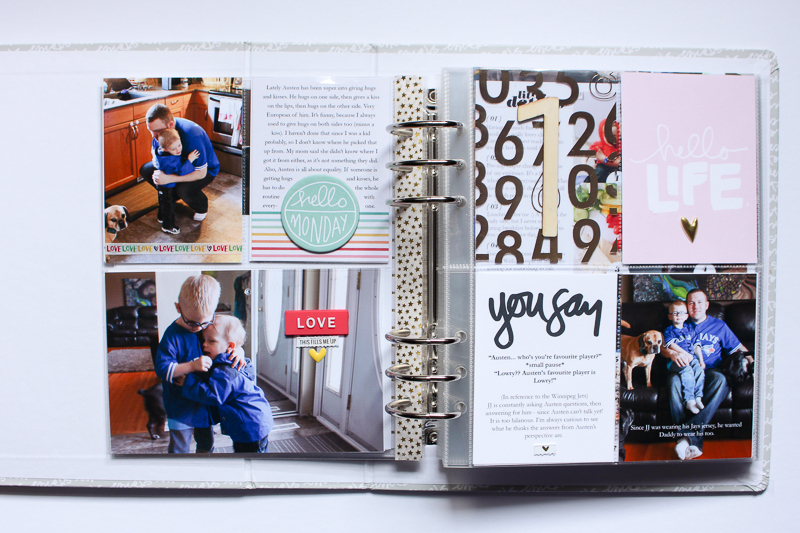 For my title page for each day I used this 2016 WITL template set of Ali's. 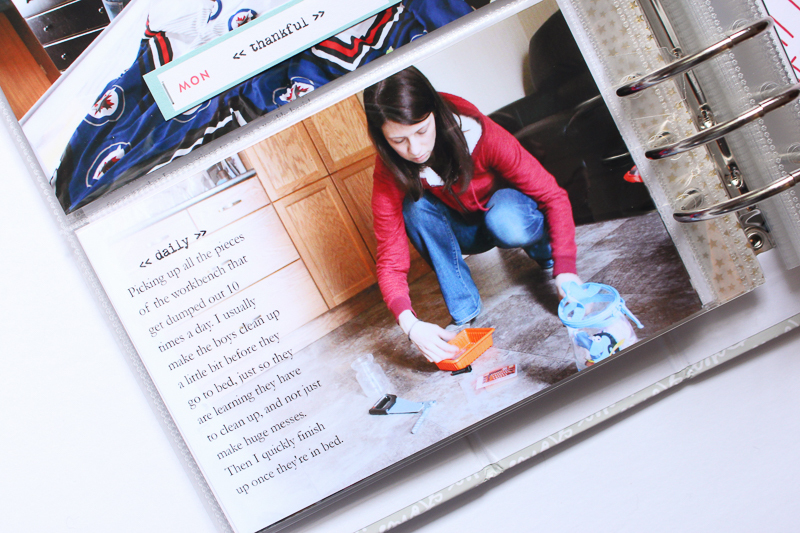 On the back of the daily title page, I am adding one of the collage templates from the same set (which one I use will vary day to day). 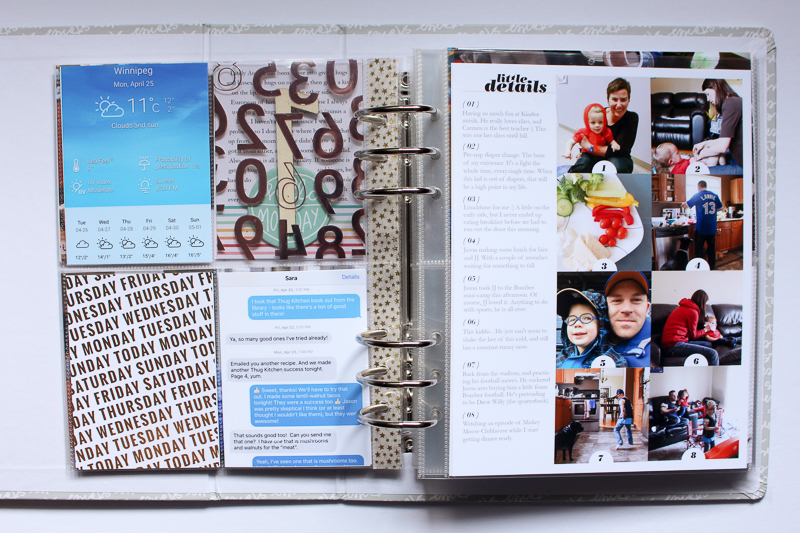 One of the things I'm not crazy about from my last year's album is all of the journaling I did directly on the photos, and wanted to avoid doing so much of it again this year. I actually love what Ali did this year (dedicated a full front/back page to capture most of her journaling, then just added directly on the photos sparingly - you can check out her blog post on that here), and would probably have done that myself, however, was already halfway through Monday with stuff done and printed out, and didn't want to essentially start again. But that idea is in my mind for next year. 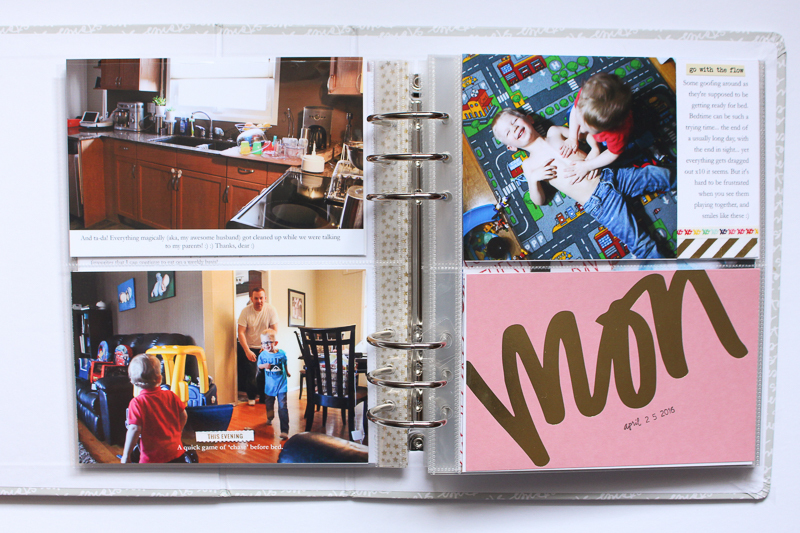 Anyhow, using those templates allows for journaling, without it being all over the photos, so I'll be using those throughout my album as well, and just minimally journaling directly on photos. I decided to use those wood veneer daily numbers in a pocket with a fold-foiled number transparency sheet I got from Michaels behind it. I'll be repeating that throughout the album. I created the "You say" card using this digital set, to capture a funny little quote from JJ. On this back side I included some phone/iPad screenshots, and that weekday card from last year's WITL kit, that I gold-foiled with my Minc :) Then, on the right side, I used another 6x8" collage template. Love that one to capture a big chunk of our day. I meant to add in the times beside each number for the journaling, but forgot. And didn't want to add them and re-print. But if I use that template again, it's definitely something I may add in. I also considered using Ali's time roller stamp that came in the Day in the Life kit, but the it's just a tad big for the space that's available there. Oh well! Another 6x8" template used here on the left again. 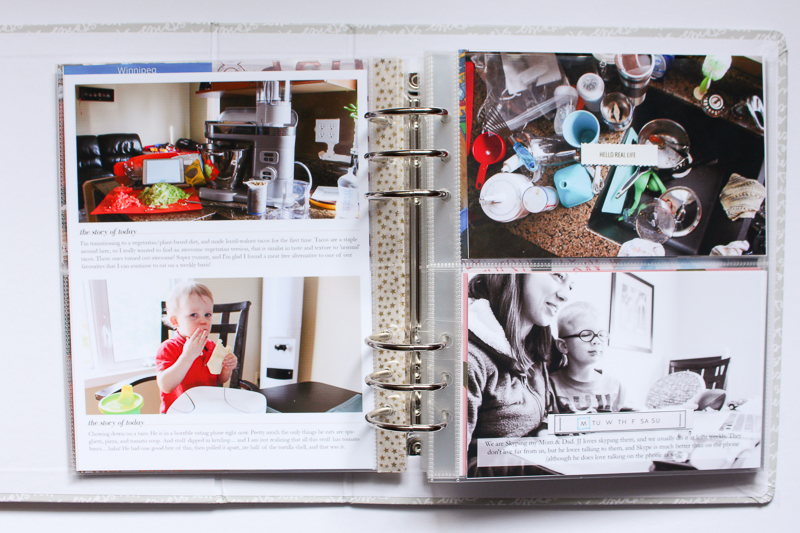 I still have quite a bit of the tear-apart word phrases from last years WITL kit, so I'm going to enjoy using them throughout my album here, as well as cutting up some of the journal cards from this years kit to add as embellishments (idea stolen from Ali). And finally, my last page for Monday. I added a gradient filter to that bottom photo to add a bit more white space on the photo for journaling, and am pretty impressed with myself, haha! I am also really loving the stamp set from last year's WITL kit, and it will probably be getting a lot of use in this years album too (as well as in my Project Life album!) Amy Jo pointed out in her post she wasn't crazy about the stamp last year when she got the kit, but it has since become one of her favourites, and I am in the same boat! I'm not sure why I didn't like it at the time, but it has become a stamp set that I reach for again and again lately. 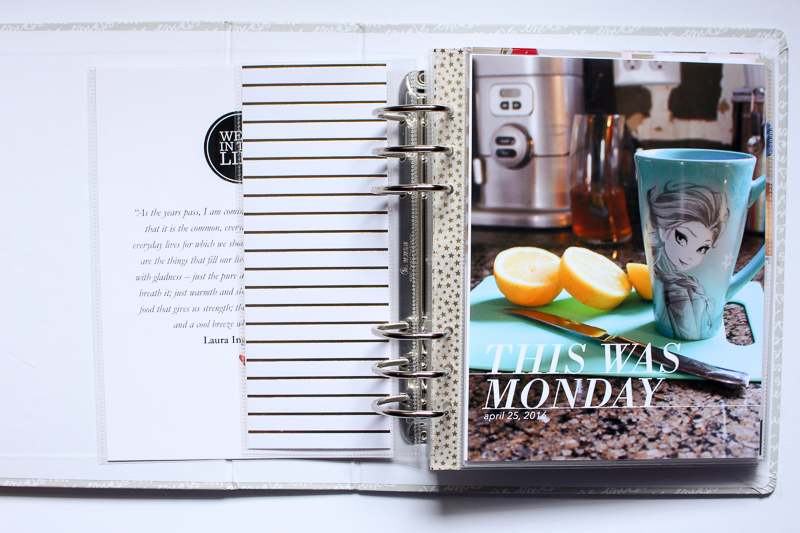 And that's Monday in my album! I'm hoping that now that I have a general 'formula' in place the rest of the days will fall together fairly easily. I'm loving how it's coming together so far, and can't wait to get this week in the books!